This sweet, heartwarming 1973 offering from the Peanuts gang (and Charles Schultz) once again shows Charlie Brown in a pickle, as his erstwhile friends impose upon the hapless would-be-host to provide a memorable and traditional Thanksgiving feast. And as much as Charlie Brown would rather forget the whole thing, he just can't help but try for fear of being labeled a failure. Ultimately it's up to Snoopy and Woodstock to save Charlie from certain embarrassment, and it falls to Linus to impart to all assembled the true meaning of Thanksgiving. This very special Emmy Award-winning cartoon features the usual sweet unassuming humor that only the Peanuts can provide, along with the melodic Vince Guaraldi score, and is one of those childhood classics meant to be enjoyed again and again. In the eight years between the first Peanuts TV special - 1965's A Charlie Brown Christmas - and 1973's A Charlie Brown Thanksgiving, they churned out quite a few other programs in the series. Ten Peanuts tales were told in the interim; most of these were TV productions, but two actually provided feature films. Over 40 more specials and movies would follow, and not even the death of creator Charles Schulz in early 2000 stopped the parade; five more specials have come out since then. I can't comment on the overall quality of the series, but two programs on this DVD show the Peanuts franchise at varying levels, from pretty good to fairly weak. On the positive side is A Charlie Brown Thanksgiving. I'm surprised it took them eight years to get to such a major - and obvious - holiday, but then again, as far as I can tell, the Fourth of July never got its own special, so I suppose Thanksgiving should count itself lucky. In any case, Thanksgiving offers a fairly fun look at the day. Essentially Peppermint Patty invites herself and some friends to Charlie Brown's house for Thanksgiving dinner, and he's too wimpy to tell her that he has other plans. Linus and the others help him create an alternate feast for the interlopers, but some complications inevitably arise along the way. Overall, the show is modest but entertaining. It seems less substantial than some of the better shows – such as the Christmas special - but it has some moments and largely appears successful. One odd aspect: this is one of the Peanuts episodes in which the lack of adults seems more noticeable than usual. The fact that Charlie makes all of these decisions and actions without any parental consultation just feels weird. Well, it beats the alternative, as we'll see later in this review when I get to the bonus program. Chalk up A Charlie Brown Thanksgiving as a good but not great Peanuts special that provides a generally fun experience. 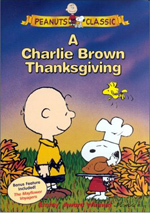 A Charlie Brown Thanksgiving appears in an aspect ratio of 1.33:1 on this single-sided, single-layered DVD; due to those dimensions, the image has not been enhanced for 16X9 televisions. The show offered an acceptable but not very strong picture. Sharpness seemed acceptable for much of the show. Some softness interfered at times, however, and those problems got worse as the show progressed. Overall, definition was okay, but the program lacked consistency. I detected no signs of moiré effects or jagged edges, and edge enhancement seemed to be absent, though some mosquito noise appeared. Print flaws were a somewhat frequent concern. The program generally seemed slightly dirty and gritty, and a few blotches appeared as well. The image also tended to wobble a bit at times. Some of these flaws stemmed from poor clean-up animation, but I got the impression most of them could be blamed on a messy source. Colors came across as somewhat iffy. They weren't pale or weak, but they definitely could have looked brighter, and they showed some runniness. Black levels remained acceptable and shadow detail - already not much of a concern in a brightly-lit cartoon - was fine. The program was watchable but average at best. The monaural audio of Thanksgiving also seemed relatively decent but unspectacular. Dialogue generally appeared clear and acceptably crisp, though some mild edginess cropped up at times, especially during slightly loud crowd scenes. This harshness also affected some of the effects, which were relatively clean but a little rough at times. The music seemed slightly flat but still offered a bit of bass on occasion. For a 35-year-old cheaply made TV cartoon, the audio seemed adequate but somewhat flawed. Only one extra appears here: a Peanuts special called The Mayflower Voyagers. This 1988 show retells the story of the original Pilgrims and their harsh journey. Although it tries to stick to some historical material, it also tosses the Peanuts gang into the mix and shows their reactions to the experience. I find this program to provide a very unsatisfying mix of historical drama and cartoon comedy. The show can't quite decide what it wants to be and the tone changes dramatically throughout the program. Actually, it sticks more strongly to the serious side of the story, which makes the levity seem all the more unpalatable; one minute we see corpses being buried, while the next shows more Charlie Brown wackiness. Possibly the oddest aspect of the show stems from the fact it presents adults. Since I haven't seen all of the Peanuts specials, I don't know if Voyagers is alone in this distinction, but it feels vaguely jarring. Admittedly, it would have been exceedingly difficult to tell this tale without showing grown-ups, but the way the show violates the Peanuts universe seems strange and unsettling. Since I originally wrote this article, some helpful readers have provided additional information on this special. It turns out that Voyagers was part of an eight-show "miniseries" during the 1988-89 TV season. Called This Is America, Charlie Brown, this project covered a variety of historical topics such as the Wright brothers' invention of the place and the 1787 Constitutional Convention. These shows also displayed adults, as did 2000's It's the Pied Piper, Charlie Brown. For more information on the Peanuts shows, visit Scott McGuire's excellent website. Ultimately, The Mayflower Voyagers is a dud. The program is dull and talky, with tone changes that feel forced and gratuitous. I like Peanuts a lot but this show did absolutely nothing for me. Overall, this DVD offers a mixed bag. A Charlie Brown Thanksgiving is a good but not great Peanuts special that provides some fun but doesn't quite live up to the heights of better shows. However, it easily outdoes the very weak companion program, The Mayflower Voyagers, which seems almost totally uninteresting. Thanksgiving features flawed but acceptable picture and sound. One big concern related to this DVD comes from its relatively high list price: the disc runs $19.95, which seems pretty steep for roughly 50 minutes of material. If you're a die-hard Peanuts fan, this disc is worth a look, but I think most folks should pass on it. Note that this DVD also can be purchased in a boxed set called The Peanuts Classic Holiday Collection. That package also includes A Charlie Brown Christmas/It's Christmastime Again, Charlie Brown and It's the Great Pumpkin, Charlie Brown and it lists for $59.95. Yes, your math is correct: there's no discount for purchasing all three DVDs together, and the only bonus is that they come in a nice slipcase.